← What was your #rowingmoment2012 ? Even though it is just 10 miles south of Chester and 35 miles west from Stoke-on-Trent, Farndon Sports and Social Club feels about as far from civilisation as it is possible to be. It is certainly a long way from mainstream sporting civilisation this weekend. Eyes are on the second Ashes Test at Lord’s or the Open golf at Muirfield. Most cycling fans are watching the Tour de France, which will finish on the Champs-Élysées on Sunday evening, after a three-week race that has covered 2115 miles. 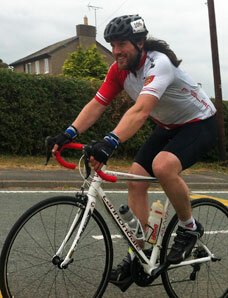 The top four riders around Farndon will combine to cover 2110 in the next 24 hours. We’re at the Mersey Roads club’s annual 24-hour race, which first took place in 1937 and which again this year doubles as the national championship. There are 91 individuals and three tandems set to start at one-minute intervals from 1pm on Saturday, with a long day, night and day ahead of them. Sit by a roundabout for six hours, in the middle of a 40-mile out-and-back circuit that starts 16 miles away from race HQ in Farndon. Move to another roundabout for four hours, at the tip of a smaller circuit keeping riders away from the evening traffic. That’s going to be pretty arduous in itself, and we’re not even on a bike. There is a sign on a small road just east of Farndon that reads “Wilko 525.07 miles”, marking the finishing point for the record-holder, Andy Wilkinson, in 1997. He also set the national record – 541.17 miles – on a Sussex circuit in 2011. Normally 500 miles is enough to secure victory but it soon becomes apparent that there are more candidates for victory than in a normal year. About 10 riders start quickly enough to be in with a chance but the lead man is Sean Childs of Royal Navy & Royal Marines CA who three hours in, is averaging 23.9mph and going like a train. “He’s about on course for where he wants to be,” says one of his support crew. Stops for the top riders are infrequent. Some are followed by support vehicles but most have a bottle or bag passed up from the roundabout every hour while they roll on. Simon stops with a loose tri bar after a couple of hours but we fix it quickly and he’s back on his way. Not everyone is in it to win it, obviously. George Berwick won in 1974 and is still going at the age of 72, although he now rides as stoker on a tandem as his eyesight isn’t up to going solo. Why do they do it? George Mallory’s line about Mount Everest seems most apt: Because it’s there. Some do it because they’re good at it, some for the sense of achievement, some for the sense of fellowship that is obvious throughout. As it gets dark, we see fewer riders out. Already 10 hours in, perhaps they’ve stopped to sleep, ready to have another go in the morning. One rider is being supported by his wife in a campervan. Approaching midnight, she shuts the door and goes to bed, leaving his food and water on a chair outside. The night hours are what count, says John Warnock, a former winner who is supporting Simon and another club-mate this year after injuring his thigh in a fall from a mountain bike. You might go out hard but if you can’t push on at a good speed through the lonely night it will all come apart. As a supporter it’s difficult to keep up with what’s going on. Riders, understandably, are struggling to stay alert. The timekeepers – posted at regular intervals around the course – ask them to shout out numbers as they approach in the dark. Many shout it at anyone, timekeeper or not. At 2am, John and his rider fumble a bottle exchange. The rider shouts “next time” but John – with his injured thigh – sprints across the roundabout to meet him successfully on the other side. I opt for a bit of a snooze in the back of the transit van and miss Spiderman. One supporter has decided a costume change will help keep his rider mentally alert in the middle of the night and crosses the roundabout to hand a bottle up as the webbed wonder. It’s 3am and we’ve lost a rider. He was due through about 15 minutes before Simon but hasn’t shown. Could be anywhere on the northern 20 miles of the course, in any kind of state. We hop in the van to see if we can spot him, which is a thankless task. Only the areas around the three roundabouts are lit; otherwise the pitch black is broken only by bike lights at regular intervals, and the occasional huge HGV powering along the A41. Stopping for a cup of tea we get a call to say he’s turned up on schedule; must have just missed him as he passed by last time. Night time may be tough but dawn must be pretty bad mentally, as riders realise they still have another eight hours to go. As an extra treat, it has started to drizzle. We head for a fry-up in a huge truck-stop cafe that has stayed open all night for the event, and several of the riders do the same. 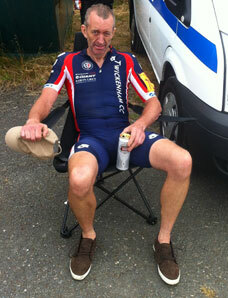 Scores for the first 12 hours are available at about 9am and the leader is Alex Kirk from Dulwich Paragon CC. Those results were compiled by 3am though and things look very different in daylight. Simon appeared off the pace in 10th but by our reckoning is sixth now, having kept plugging through the small hours. Sean Childs has just taken 87 minutes to get around a 13-mile circuit and it just one of those now sporting a thousand-yard stare. “Well done Steve,” shouts John to one rider. “Seventy-five,” he replies. This circuit took about 35 minutes last night; this morning it’s more like 42. Last year’s winner, Ultan Coyle, is looking strong, as is Stuart Birnie of Willesden CC. Car drivers on Sunday morning appear pretty bemused by the massed ranks of supporters in laybys, even without knowing that they have been in similar positions for the previous 20 hours. There is a road race taking place around Farndon during the morning but once that has finished, the time trailers are routed north to the finish circuit. Marshalls are placed every two miles around it; riders are logged by each and their 24-hour score is taken from the last one passed, plus a calculation based on average speed for the extra few hundred yards. There has been a friendly atmosphere throughout but it is here that the camaraderie between supporters and riders is most obvious, as every rider past HQ receives a cheer and many respond with a smile and a wave. “What a charming bunch of people,” commented one rider on a forum afterwards. Less serious riders stop at HQ as their finish time approaches. Others roll in from around the course having clocked their last few miles. We find Simon slumped next to a parish church, pretty confident of a new PB, and head back to Farndon, where the car park is full of riders slumped on deckchairs, staring into the middle distance. Two riders have topped the 500-mile mark, Birnie’s 518.372 trumping the 513.655 ridden by Coyle, who won last year with 25 miles fewer. Lynne Taylor wins the women’s event for the 13th time after covering 423.428 miles. We make it home in our transit van just in time to see Chris Froome cross the finish line in front of the floodlights and flashbulbs in Paris. But the fulfilment of competition is the same at whatever level you compete, and whatever distance you cover. 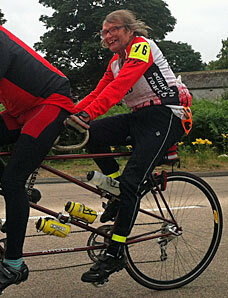 This entry was posted in cycling, participation. Bookmark the permalink. How many miles did Simon go? He did 482.16 – previous best was 480, when he came second.